Before the Mazda RX-8 came onto the scene and reminded the entire automotive world of the existence of triangles, we had the little RX-7. The Mazda RX-7 has become an “internet car.” Currently, YouTube is full of theoretically infinite videos of highly modified RX-7s of all generations with far too many angry rotors buzzing under the hood. There is absolutely nothing wrong with an RX-7 equipped with a hornet’s nest of spinning triangles in the engine bay. However, it’s sometimes refreshing to see a stock RX-7 content with remaining just how Mazda made it. It warms my heart. I spotted this particular example while running errands. My day was instantly made better at the sight of the RX-7. This first generation example was sitting next to a BMW convertible, a wood-paneled PT Cruiser and a beat-up Japanese drift missile. Aside from the Transformers logo on the back and a somewhat crumpled rear bumper, this RX-7 seems to be almost entirely unmodified and in overall good shape. That’s rare to see in a car that was mostly used to do donuts in a mall parking lot in 1991. It warms my heart to see that someone cares for a classic piece of Japanese automotive history. After all, it did help bring the rotary to the masses. 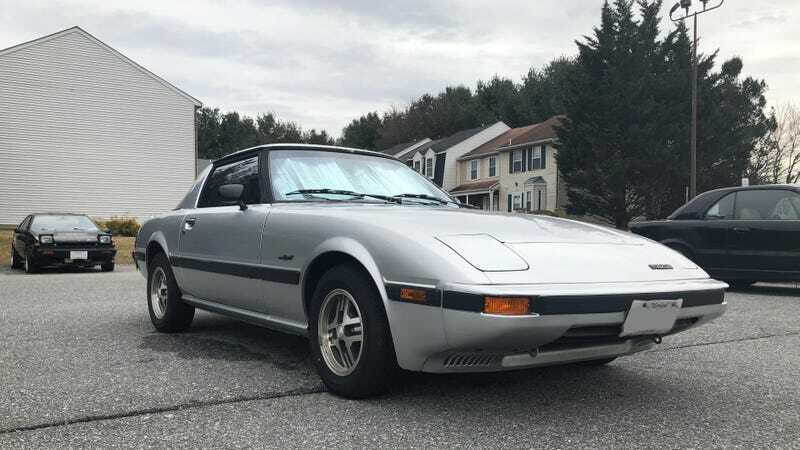 More than 370,000 RX-7s were sold in the United States during the first generation of production and outside of the occasional one buzzing through town, they really aren’t anymore and that makes me sad. Until Mazda decides whether or not to bring back a rotary sports car, we need to preserve the legacy of everyone’s favorite triangle evangelist.